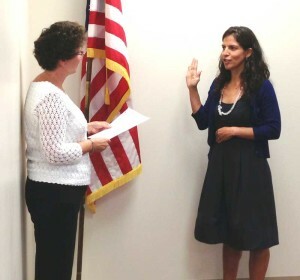 Leticia Flores DeWilde takes to oath of office from Unionville-Chadds Ford School Board President Eileen Bushelow, Monday night. Flores DeWilde replaces Frank Murphy and was appointed last month to serve through November. EAST MARLBOROUGH — With the opening of the 2013-14 school year, Unionville-Chadds Ford School District officials are working hard to finalize repairs and various upgrades to district school buildings, a topic that largely dominated Monday’s Board of Education worksession. After taking time out to welcome and swear in Leticia Flores DeWilde, the new board member appointed last month to replace Frank Murphy, much of the meeting discussion was devoted to the district’s six schools and the process of getting them ready for the school year. Two major projects, one to rebuild the facade at Unionville Elementary and a storm water management revision at Hillendale, are largely complete, said Rick Hostetler, the district’s supervisor of Buildings and Grounds. While both projects have a few details left — as an example some 600 trees will be planted at Hillendale later this fall — both buildings will be ready to open for the start of school on Aug. 26. Elsewhere, smaller projects have been done to improve district schools, maybe the most coming at Charles S. Patton Middle School, Hostetler said. Working with building principal Tim Hoffman, the district is making a few upgrades to the building. In the lobby, the bank of teacher mailboxes has been removed and replaced with windows, so staff in the main office can now see the lobby. As aesthetic upgrade, it also improves security, allowing staff to see who is entering the building. A pilot program to improve the upstairs hallways — which tend to be a little dark — is also underway, with new lighting (the existing lighting is no longer being made and will ultimately need to be replaced, Hostetler said), ceiling tiles and paint to brighten the atmosphere. If successful, similar work will be done to the rest of the upstairs hallways. The auditorium will also have a new look with school color stripes — gold and purple — as well as a new curtain for the stage. Later this year, a student-painted mural will also be added. Although few projects are being done at the high school, which just underwent a renovation, the football stadium is seeing a couple of planned upgrades. The new ticket booth/entry is almost completed — paid for by a donation from the Unionville Sports Council — and the new scoreboard is mostly installed. The new scoreboard is being funded from advertising, although at least one sponsor is being sought to join primary sponsor Horizon Heating and Plumbing. Also, the district plans to do a facilities study for Patton and Hillendale, both of which have gone nearly two decades without major renovation — to see what the district’s building needs are going to be over the next five to 10 years, by Lancaster-based Marotta and Main (M&M) Architects. The buildings will be fully evaluated by M&M. Building principals and facilities staff will be consulted, and each facility will be checked for compliance with building code, as M&M develops a long-term plan for the buildings. Lastly, Hostetler said he is asking the board for approval to replace 77 district radios — the current units are no longer Federal Communication Commission certified — and purchase a new dump truck, to replace a 19-year-old model (bought used from Pocopson Township), as it will no longer pass state inspection.